The late 50s and early 1960s saw many so-called heart throb artists pushed off on the American teenage population. Most of them were very attractive guys who had a strong visual appeal to teenage girls, but had minimal singing talent, which meant that they had a few hits before their fans moved on to other artists . 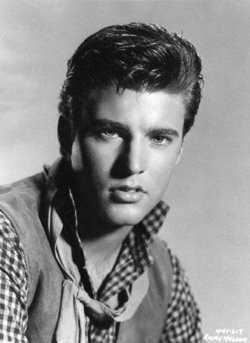 Ricky Nelson was one such artist, who also had the advantage of a weekly platform on his parents popular television show THE ADVENTURES OF OZZIE AND HARRIET. Unlike most of his teen-throb counterparts, Ricky Nelson had real talent and was able to sustain his musical career throughout his short life, charting 53 songs on the Billboard Hot 100 between 1957 and 1973. Ricky Nelson was the younger son of big band leader Ozzie Nelson and Ozzie’s featured singer (and later wife) Harriet Hilliard Nelson. Ozzie’s band was very successful, having many hits including a #1 record in 1935 with “And Then Some”. From 1944 onward, Ozzie & Harriet were involved in the THE ADVENTURES OF OZZIE AND HARRIET, initially on radio and then from 1952 to 1966 on television. Starting in 1949 Ricky and his brother David had roles as themselves on the show. After his death, Ricky’s sons would score a #1 record recording as the group ‘Nelson’, making the Nelson family one of two answers to the trivia question “what musical family had #1 pop records in three consecutive generations?”. Ricky Nelson’s recording career began in 1957 when he covered the Fats Domino hit “I’m Walking'” b/w “A Teenager’s Romance”. Both sides charted in the top four. From there Ricky would have eighteen top ten records through the end of 1963 including two #1s in “Poor Little Fool” (1958) and “Travelin’ Man” (1961). Ricky’s records were always noted for having a really tight band with ace guitarist James Burton featured on most of his records. In addition to his family’s television show, Ricky Nelson appeared in several films including the classic western RIO BRAVO with John Wayne. Ricky Nelson recorded and release many country songs both as singles and as album tracks. County radio played many of his singles with five of them charting country including his #10 cover of Hank Williams’ “My Bucket’s Got A Whole In It” and “Poor Little Fool” which reached #3. Several of Ricky’s pop hits that did not chart on the country charts, were either country songs such as “Have I Told You Lately That I Love You” or songs written by songwriters such as Baker Knight who came to be identified with country music. Moreover, many of Ricky’s songs have been covered as album tracks by country acts including such songs as “Hello Mary Lou” , “Travelin’ Man”, “Lonesome Town” and “Never Be Anyone Else But You”. After the “British Invasion” wiped out the early rock & rollers and the “Philly Cream Cheese” doo-woppers, Ricky Nelson went more overtly country in his musical quests, recording a pair of straight ahead country albums for Decca, BRIGHT LIGHTS AND COUNTRY MUSIC and COUNTRY FEVER, both really solid albums. Toward the end of the 1960s and tired of being considered an “oldies” act, Nelson revamped his name and image, becoming Rick Nelson and putting together the Stone Canyon Band, a country-rock band which featured former Buck Owens’ Buckaroo Tom Brumley on steel guitar. The band issued five albums, all of which charted. The fourth and most successful album 1972’s GARDEN PARTY charted both pop and country and also charted in Canada. The featured single “Garden Party” was Rick’s first top ten single in nine years reaching #6 (also #1 on the adult contemporary chart and #1 on the Canadian pop chart). “Garden Party” would prove to be Rick’s last real hit. When Rick died in a small plane crash on December 31, 1985, millions mourned. He was elected to the Rock and Roll Hall of Fame in 1987, and has also been elected to the Rockabilly Hall of Fame.